GBP is being supported due to economic growth after the Brexit such as Construction PMI, Mortgage Approvals and Consumer Credit. 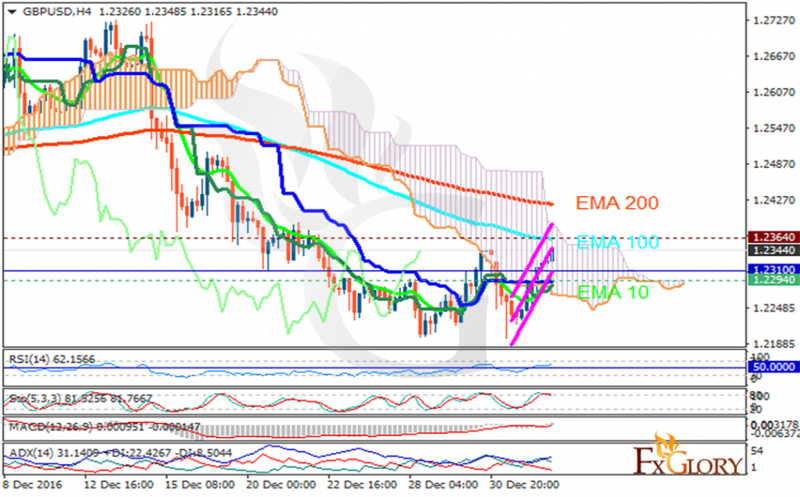 The support rests at 1.22940 with resistance at 1.23640 which the weekly pivot point at 1.23100 is located in between the lines. The EMA of 10 is moving with bullish but it is below the EMA of 100 and the EMA of 200. The RSI is rising above the 50 level, the Stochastic is moving in high ranges and the MACD indicator is in neutral territory. The ADX is showing a buy signal. The price is in the Ichimoku Cloud and it is above the Chinkou Span. The Tenkan-sen is showing an upward trend and the Kijun-sen is showing horizontal trend. The pair will be fluctuating between 1.2200 to 1.2350 levels.